In a recent blog post, we wrote about some of the dangers of antiperspirants and deodorants. Who else felt an inner cringe when it was first suggested they should switch to a natural antiperspirant or deodorant? You are not alone! The word “natural” when it comes to deodorant brings to mind the “earthy” folks from college who sat next to you and all you smelled was BO. Rest assured friends, you do not have to be the smelly person. 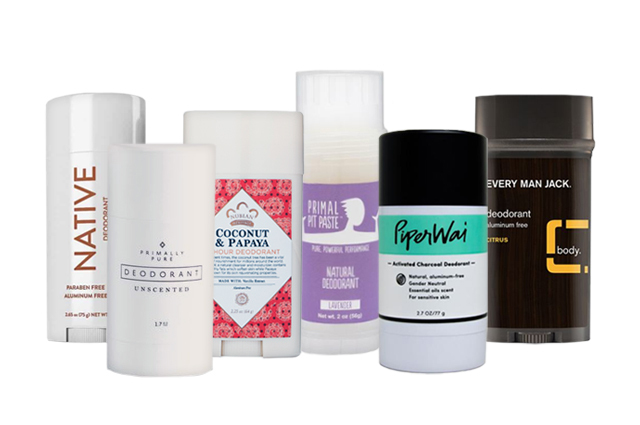 There are GREAT natural deodorants out there – and we have probably spent hundreds of dollars trying to find them! Here are a few which we have tried, tested, and love! NATIVE – This is our favorite choice at the Well because we believe it works the best! This option is available at our offices, and it comes in a variety of great scents, for men and women. The formulation is non-toxic and yet it works well, all day long. It is also available in a sensitive formulation for anyone who has sensitivity to baking soda in deodorant. Give it a try – we have had 100% positive feedback from our clients and staff. Piperwai – Piperwai is made with activated charcoal, which absorbs wetness and neutralizes odor – win-win! Piperwai also has coconut oil, shea butter, cocoa butter, and pure vitamin E oil in it, which help to keep that sensitive underarm area from drying out. There are 11 therapeutic-grade essential oils used in the formula as well, so on top of all the other pluses, it smells nice too. It may take you a little bit of time to get used to the jar formula, but after a few uses, you will figure out YOUR perfect amount of product to use. If a jar formula is not to your liking, there is also a new stick formula available. Primally Pure – This is the next deodorant on our list to try. We have heard great reviews from clients about this line. The base of this deodorant is tallow from grass-fed cows. Mixed with arrowroot powder, extra virgin coconut oil, beeswax, baking soda, and a variety of essential oils, it creates a beautiful and protective option. Primal Pit Paste – This is another popular option among our clients. Similar to the Piperwai, it is a paste you apply with your hands. They also have a stick option for those not wanting to apply with their hands. One cool thing about this line is that they offer deodorant options based on the level of activity you do: Sensitive for sensitive skin, Light for those who are light to moderate in daily activities, and Strong for those who need a little more protection. We hope you find a good fit for you in this list. There are many other options out there; these are just the ones that we have tried and LOVED!! Remember to give your body time to adjust to any natural deodorant. Also, remember that sweat is a natural (and healthy) occurrence. Be patient and enjoy trying new products! The Well of Life Center is a holistic wellness center that specializes in nutrition, chiropractic, massage services, and more. Celebrating their 11th year in business, the Well of Life Center has locations in Doylestown and Bethlehem, as well as a Spa & Fitness center in Ottsville, PA. For more information, please visit welloflifecenter.com.